These travel trailers offer more in terms of floor plans, options and features than all others in the same class. Rockwood Ultralite travel trailers come in a wide range to ensure that you get the best fit as per your requirement. Whether you want a mini trailer or a larger trailer with extensive floor plans you are bound to find your best fit. Rockwood Ultralite trailers come with added style and comfort features designed to create a feeling of “home away from home”. 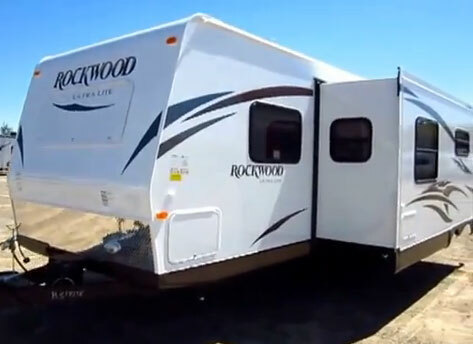 Be sure to find the most comfortable ultralite travel trailers from Rockwood. Rockwood Ultralite travel trailers are built to give you the best on the road experience while minimizing the trailers weight, rest assured that the trailers are built from light weight but high strength materials. From external features right through to the interior, you will appreciate the effort and time invested in creating the best on the road housing for your travels. 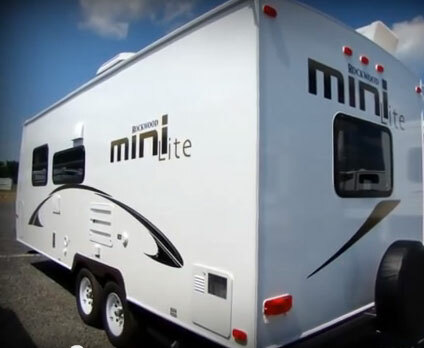 Rockwood Mini-Lite trailer is not "Mini" at all, but certainly it is lite! Body crafted from fully laminated aluminum frame including the roof and sidewall together with R-7 side wall, R-12 floor and R-14 ceiling insulation factors. The sidewalls are built from laminated fiberglass. The radius roofs with interior vaulted ceilings come with a rubber composite roofing membrane to ensure long lasting and all-weather resistance. The radius corner windows and doors coupled with a large dinette picture window provide ample entry of natural light and air circulation. The trailer has added support from the strategically positioned stabilizer jacks for enhanced stability when parked. Outside speakers, shower and grill prep ensure that you enjoy the outdoor weather with maximum convenience. There are outside antifreeze stations two 30 lb. gas bottles with moulded bottle cover. These lightweight travel trailers come with a double or triple entry step. You will also find a TV antenna with cable and satellite hook-up so that you can enjoy your favorite shows while on the road. Just see it yourself - Rockwood Lite model for 2015! Screwed and glued wood cabinetry with solid wood and raised panel doors and drawers for added space. Flooring made from a highly durable carpet and engineered mould and mildew resistant floor covering. Interior entertainment options including a 32” LCD TV with 5.1 Digital Dolby Surround Sound, Digital AM/FM/CD/DVD with a remote and an MP3 player hook up. The dining area composed of a spacious 44”x84” king-U-style dinette. Fully equipped kitchen that will give you home-like feeling with its electric refrigerator, three burners high output gas range with glass stove top cover, double bowl sink with residential style faucet, microwave oven, and cutting board.